Joe Pasquale in Some Mothers Do ‘Av ‘Em. Images Scott Rylander. It takes a bold writer willing to reinvent a British institution and an even braver entertainer prepared to portray a comic icon so closely associated with one man. But Guy Unsworth, not even born when Michael Crawford captured our hearts as accident prone Frank Spencer in the 1970s BBC TV sitcom Some Mothers Do ‘Ave ‘Em, has achieved the impossible – thanks to an ear for the rhythm of the original Raymond Allen TV scripts and the brilliance of veteran funnyman Joe Pasquale. 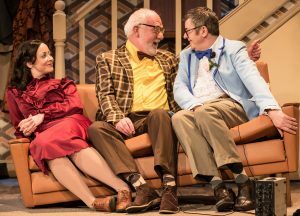 Unsworth, brought up on re-runs of the show, has written and directs a stage version of Some Mothers Do ‘Ave ‘Em which is now touring the UK and opened, this week, at Richmond Theatre, starring Pasquale as the hapless Frank. I can’t remember the last time I sat in a theatre and listened to an entire audience (with the exception of a po-faced national newspaper critic sitting nearby) belly-laugh throughout an entire production. Comedy is highly subjective but humorous modern plays barely seem to raise more than one or two occasional smirks, perhaps the odd titter, from theatre-goers. This production, carrying all the provenance of the original sitcom plus the expertise and timing of a seasoned entertainer, has them crying with laughter. It’s terrific. It probably helped that stars of British light entertainment, including Bobby Davro and Shane Richie, turned out to support their colleague on the opening night. 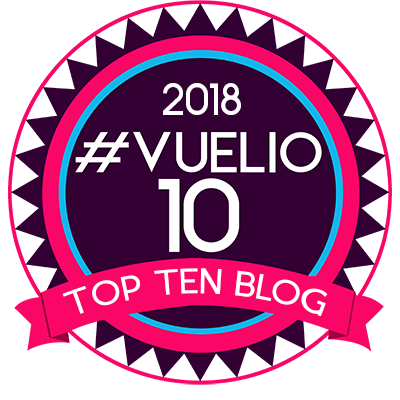 They, along with the likes of Pasquale, Bradley Walsh, Brian Conley and Les Dennis, are dream casting for any comedy whose success rests with a leading man who is inherently funny and a seriously good actor. But the warmth and affection on show for both the production and its cast was evident. We all loved the TV series and some of its unforgettable catchphrases are still instantly recalled (Ooh, Betty!). 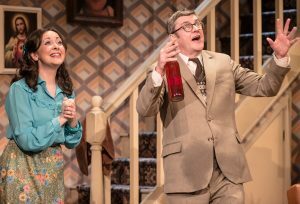 This stage version, far from being a pale imitation, is a triumphant homage to the original sitcom. Pasquale, rightly, doesn’t try to imitate Michael Crawford’s distinctive delivery. Instead, he adopts hints of the voice and mannerisms and blends it with his own, very unique, high-pitched voice and brand of slapstick, honed from years as a stand-up and touring with one-man shows. 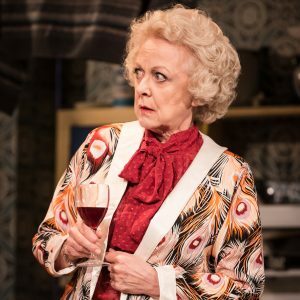 The result is a flawless and madcap performance, aided and abetted by a hilariously funny script and a knock-out supporting turn from consummate comic actor Susie Blake, who plays his mother-in-law, Barbara Fisher. Sarah Earnshaw as Frank’s wife, Betty, is the straight man for the purposes of the show. God knows how she manages to keep a straight face when her well-meaning husband is creating mayhem on stage. Veterans Moray Treadwell and David Shaw-Parker, plus Chris Kiely, who all have an extensive body of work behind them, add to the production’s success. Unsworth’s beautifully daft script borrows heavily from the TV series without being an outright copy. The gags are fast and furious, the physical comedy outrageously hazardous and designer, Simon Higlett’s, 1970s inspired and very clever set, ripe for a night of chaos. Betty’s having a baby and she doesn’t know how to tell the out-of-work Frank. He is trying to find work with his magic act and it’s not going well… until he receives a letter from the BBC asking him to audition for a new talent show. 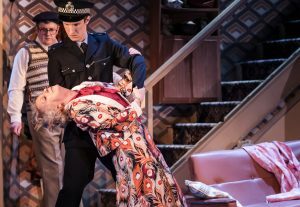 Their priest (Shaw-Parker) drops around and then Betty’s mum, with her new beau, the bank manager David Worthington (Treadwell) arrives for dinner. The BBC are due any minute but Frank makes the mistake of breaking open the prune wine. An inebriated Mrs Fisher becomes a wildly uncontrollable force of nature as does her host, whose home audition leaves everyone spellbound. Frank’s dialogue is peppered with hilarious spoonerisms and double entendres and is a perfect fit for Pasquale’s talents. It’s absolute pandemonium and a riot from beginning to end. Don’t miss one of the funniest stage shows in years. At Richmond Theatre until Saturday. For full tour details click HERE and for picture galleries go to www.facebook.com/StageReviewUK. 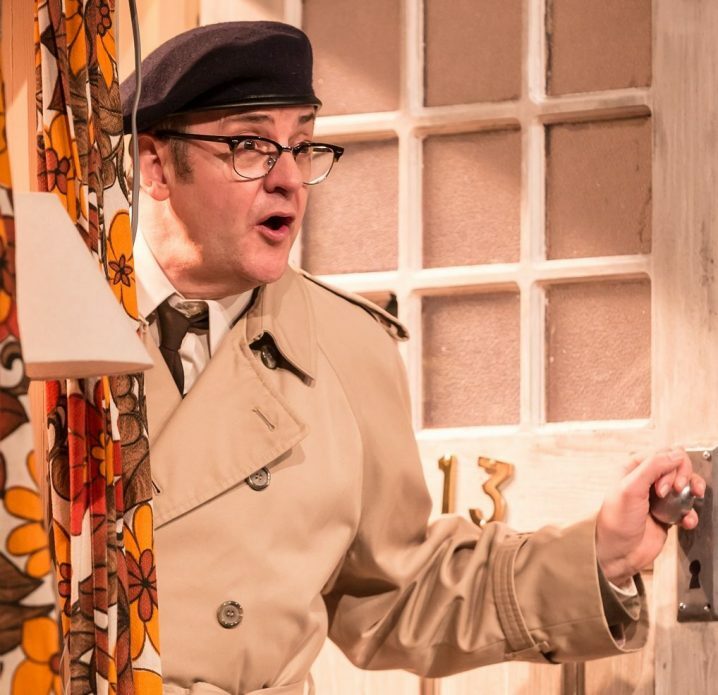 Joe Pasquale creates mayhem as Frank Spencer in the hilarious Some Mothers Do ‘Ave ‘Em. A riot from beginning to end. Don’t miss one of the funniest stage shows in years.